Woodpeckers are beautiful birds, but unfortunately for birders many woodpecker species look very similar. By understanding exactly what field marks to look for and other clues to identify these birds, however, it can be easy to tell which woodpecker is which. Optics: Birding binoculars are the ideal tools for getting good, close views of these birds. Binoculars should have a large aperture to admit plenty of light in shaded forests, and stronger magnifications are often preferred so tiny details of woodpeckers' plumage becomes clear. Because these are active birds in dense forests, spotting scopes are not as useful. Field Guide: Most field guides include sections dedicated to woodpeckers, and looking for a guide that offers images of different genders and bird poses is best. Range maps are also useful, and because many of these birds are similar, a field guide that groups woodpeckers by appearance can be helpful for faster identification. Recordings: Birding by ear is useful for identifying woodpeckers when birders are familiar with different drumming patterns. While using recordings in the field is controversial, practicing with woodpecker drumming recordings can be a good exercise for easy identification. Size: How large is the bird compared to the tree or branch it is perched on? How do the head and neck compare proportionally to the body? Plumage: What are the most prominent colors in the bird's plumage? Are there any color patches on the back or wings? Is there any streaking, barring, or spotting? Head Markings: Does the bird have any cheek stripes, eyebrows, mustache lines, or cheek patches? What color patterns are present on the face? What are the colors of the forehead, throat, cap, and nape? Does the bird have a crest? Underparts: Are the underparts plain, barred, spotted, or streaked? Are there any color washes on the chest or lower abdomen? Does the bird have a bib? Bill: How long is the bill compared to the bird's head? What color is it? What is the bill's thickness? Back: Is the bird's back a solid color or does it have a white patch? Is there any barring, streaking, or striping on the back? Wings: Are wing patches or markings visible when the bird is perched? What is the wing pattern of the bird in flight? While birders will rarely be able to see all of a woodpecker's field marks at once, observing the bird carefully can reveal enough clues for a positive identification. If it is not possible to be certain of a woodpecker's identity just by looking at the bird, there are other clues to consider to puzzle out which bird it is. Sounds: While woodpeckers do not sing, their drumming is as distinctive as any song. Listen for the tempo, pitch, and frequency of drumming to help determine a pattern that can identify the bird. Listening carefully can also help birders more easily locate a bird to see it better. Range and Habitat: Most woodpeckers stay in a general range throughout the year. Knowing which woodpeckers are likely to be in a certain range can be helpful for identification because there are no migrant birds to consider. Furthermore, some birds prefer larger, older trees, while other woodpeckers have different habitat preferences or may be more regularly seen in certain types of forests or at certain elevations. Holes: Birders who are fortunate to see woodpeckers excavating holes can use those holes to help determine the bird species. Different woodpeckers drill different sizes and shapes of holes, and how the holes are arranged, either as a single, deep cavity or a row of smaller, uniform holes, are clues about the birds that drilled them. Foraging Behavior: If a bird can be observed long enough, birders can use its behavior as clue for what bird it is. Different woodpeckers forage differently, with some pecking lightly to get surface insects from the bark while other birds pry under the bark or even peel it away to find food. The type of food, such as insects, nuts, or fruit, can also be a clue about a woodpecker's identity. 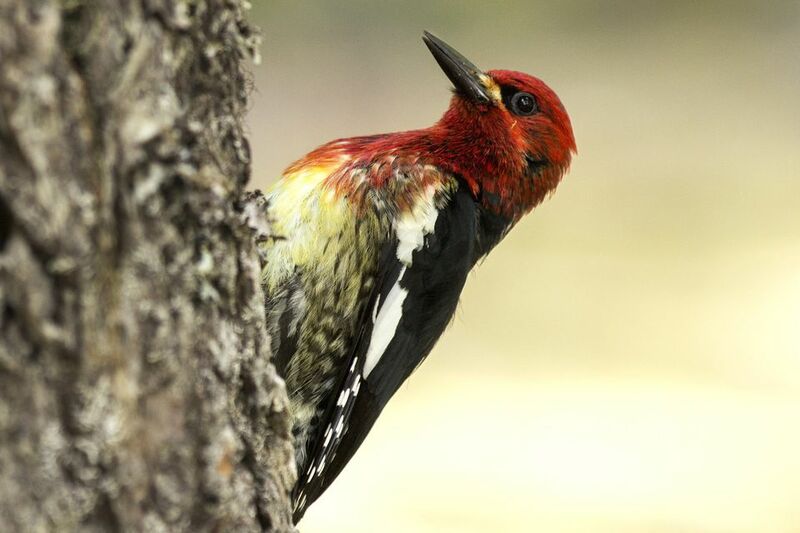 By studying not only how woodpeckers look but also how they sound, where they live, and how they behave, birders can learn to identify different woodpecker species with ease. Downy or Hairy - Which Woodpecker Is Which?